Salesforce.com is fluffing up its cloud business – but at a lofty cost. Boss Marc Benioff’s online-software company has agreed to pay $2.8 billion for e-commerce specialist Demandware. That may add some zip to slowing growth while boosting a heated rivalry with old-school Oracle. But the price includes a high premium of nine times estimated revenue, a possible sign of fog ahead. Software that operates in the cloud – essentially large servers accessible through the internet – has a lot to offer. It’s quick and relatively cheap to set up, easily accommodates additional users and capacity and is updated continuously. As a result, more big businesses are switching to it from traditional software based on individual computers. That’s a major reason Salesforce revenue has been growing about 25 percent each year. The problem is that investors may be looking for more, given the company’s $57 billion market capitalization. Margins are improving, but Salesforce is still barely profitable. Acquiring Demandware could refocus shareholders on growth, buying the company a bit more time. Online retailing is a hot area. Even with the likes of Amazon booming, it still accounts for less than 10 percent of total U.S. sales. That leaves plenty of opportunity for Demandware, whose specialty is helping the likes of Adidas, Brooks Brothers and Clarins set up shop online. Plugging the company into a much larger enterprise could help it grow. Salesforce paid almost as much for cloud-marketing firm ExactTarget three years ago, and that company has by all accounts expanded significantly since, though its revenue isn’t stated separately. The Demandware deal also involves a bit of one-upmanship, helping Benioff stick it to long-time rival Oracle and its boss, Larry Ellison. Oracle has been caught somewhat flat-footed by the rise of cloud software, and Salesforce is aiming for a substantial edge in retailing software. The purchase price is an aggressive bet on growth. If Demandware doesn’t deliver over several years, Salesforce will have wasted a chunk of its cash. Yet Benioff has made such bets before – and won. What’s more, many fast-growing, cash-burning, privately held cloud firms have recently fallen in value. That could whet Benioff’s appetite for acquisitions even further. A Salesforce sign is seen during the company's annual Dreamforce event, in San Francisco, California November 18, 2013. 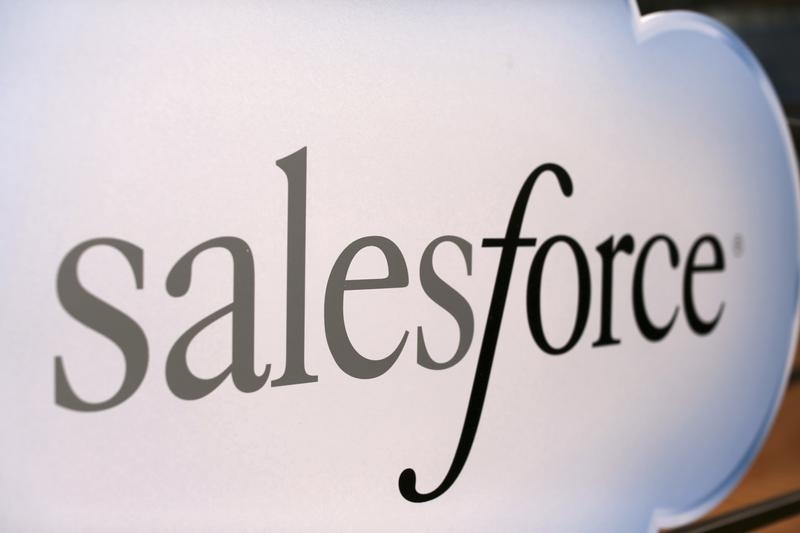 Salesforce.com said on June 1 that it had agreed to pay $2.8 billion, net of cash, for e-commerce firm Demandware. The price of $75 per share represents a 56 percent premium over the closing price of Demandware stock on May 31. The acquisition is Salesforce’s largest to date, topping its $2.5 billion purchase of marketing-software maker ExactTarget in 2013.